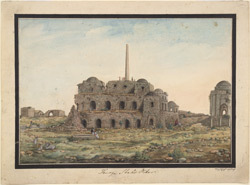 Watercolour of Kotla Firuz Shah, Delhi, by a Delhi artist, c.1820-25. Inscribed on front in English: 'Feroze Shah's Pillar;' in Persian characters: 'Naqshah i kotlah i kunhan i mutassil i Dihli i mashhur ast' (Picture of the famous old kotla near Delhi). Firoz Shah Tughluq ruled the Delhi Sultanate from 1351-88. He began construction of a new city on the banks of the Jumna in 1354, the fifth city to be built at the site of Delhi and known as Firuzabad. The walled city included a large congregational mosque, residential palaces, halls of private and public audience, and various utility buildings. This view shows the Kushk-i-Firuz or Palace of Firuz. This structure comprises a series of three square tiered arcades surmounted by an iron pillar. This pillar was originally erected in the third century BCE by the Mauryan ruler Ashoka in Amballa and was later transported to this new capital by the Tughluq sultan as a symbol of dynastic power at the centre of his empire. The ruined city is often referred to as Kotla Firuz Shah.